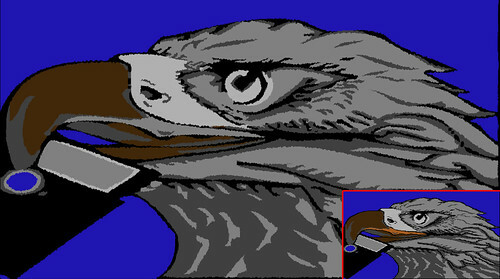 I was chatting with Amok and he mentioned something about the Eaglsoft Logo and this is what I came up with. Re: Enhancing C64 Title Screens. 1st one looks good, the ripple in the 2nd one rather looks like poor upscaling, so definitely go for the first one. THIS is what I call real enhancing of C64 screens: http://users.skynet.be/NightGem/c64_newbarbarian.htm. Remember to check out the other ones too! job re-pixeling them, which keeps them in their original 8-Bit form. bad either, but I want something different and not sure what it is and how I'm going to get there. But when I do, you guys will be the first to know about it. Why not take your favourite game and do it in 3D? Hey thats an idea. I'd have to start with something simple.